Not to be confused with New Siberia. Novosibirsk (/ˌnoʊvəsɪˈbɪərsk/, also UK: /ˌnɒv-, -oʊsɪˈ-/; Russian: Новосиби́рск, IPA: [nəvəsʲɪˈbʲirsk]) is the third-most populous city in Russia, after Moscow and St. Petersburg. It is the most populous city in Asian Russia, with a population of 1,612,833 as of the 2018 Census, and is the administrative center of Novosibirsk Oblast as well as of the Siberian Federal District. Novosibirsk, founded in 1893 at the future site of a Trans-Siberian Railway bridge crossing the great Siberian river of Ob, first was named Novonikolayevsk (Новониколаевск), in honor both of Saint Nicholas and of the reigning Tsar Nicholas II. It superseded nearby Krivoshchekovskaya village, which was founded in 1696. The bridge was completed in the spring of 1897, making the new settlement the regional transport hub. The importance of the city further increased with the completion of the Turkestan–Siberia Railway in the early 20th century. The new railway connected Novonikolayevsk to Central Asia and the Caspian Sea. At the time of the bridge's opening, Novonikolayevsk had a population of 7,800 people. The frontier settlement developed rapidly. Its first bank opened in 1906, and a total of five banks were operating by 1915. In 1907, Novonikolayevsk, now with a population exceeding 47,000, was granted town status with full rights for self-government. During the pre-revolutionary period, the population of Novonikolayevsk reached 80,000. The city had steady and rapid economic growth, becoming one of the largest commercial and industrial centers of Siberia. It developed a significant agricultural processing industry, as well as a power station, iron foundry, commodity market, several banks, and commercial and shipping companies. By 1917, seven Orthodox churches and one Roman Catholic Church had been built there, several cinemas, forty primary schools, a high school, a teaching seminary, and the Romanov House non-classical secondary school. In 1913, Novonikolayevsk became one of the first places in Russia to institute compulsory primary education. The Russian Civil War took a toll on the city. There were wartime epidemics, especially of typhus and cholera, that claimed thousands of lives. In the course of the war the Ob River Bridge was destroyed. For the first time in the city's history, the population of Novonikolayevsk began to decline. The Soviet Workers' and Soldiers' Deputies of Novonikolayevsk took control of the city in December 1917. In May 1918, the Czechoslovak Legion rose in opposition to the revolutionary government and, together with the White Guards, captured Novonikolayevsk. The Red Army took the city in 1919, retaining it throughout the rest of the Civil War. Novonikolayevsk began reconstruction in 1921 at the start of Lenin's New Economic Policy period. It was a part of Tomsk Governorate and served as its administrative center from December 23, 1919 to March 14, 1920. Between June 13, 1921 and May 25, 1925, it served as the administrative center of Novonikolayevsk Governorate, which was separated from Tomsk Governorate. The city was given its present name on September 12, 1926. When governorates were abolished, the city served as the administrative center of Siberian Krai until July 23, 1930, and of West Siberian Krai until September 28, 1937, when that krai was split into Novosibirsk Oblast and Altai Krai. Since then, it has served as the administrative center of Novosibirsk Oblast. The Monument to the Heroes of the Revolution was erected in the center of the city and has been one of the chief historic sites (essentially every child had to visit the monument on school field trips during the Soviet years). Neglect in the 1990s while other areas were redeveloped helped preserve it in the post-Soviet era. During Joseph Stalin's industrialization effort, Novosibirsk secured its place as one of the largest industrial centers of Siberia. Several massive industrial facilities were created, including the 'Sibkombain' plant, specializing in the production of heavy mining equipment. Additionally a metal processing plant, a food processing plant and other industrial enterprises and factories were built, as well as a new power station. The great Soviet famine of 1932–33 resulted in more than 170,000 rural refugees seeking food and safety in Novosibirsk. They were settled in barracks at the outskirts of the city, giving rise to slums such as Bolshaya Nakhalovka, Malaya Nakhalovka, and others. Its rapid growth and industrialization led to Novosibirsk being nicknamed the "Chicago of Siberia". Tram rails were laid down in 1934, by which time the population had reached 287,000, making Novosibirsk the largest city in Siberia. The following year the original bridge over the Ob River was replaced by the new Kommunalny bridge. Between 1941 and 1942 more than 50 substantial factories were crated up and relocated from western Russia to Novosibirsk in order to reduce the risk of their destruction through war, and at this time the city became a major supply base for the Red Army. During this period the city also received more than 140,000 refugees. The rapid growth of the city prompted the construction during the 1950s of a hydroelectric power station with a capacity of 400 megawatts, necessitating the creation of a giant water reservoir, now known as the Ob Sea. As a direct result of the station's construction vast areas of fertile land were flooded as were relic pine woods in the area; additionally, the new open space created by the reservoir's surface caused average wind speeds to double, increasing the rate of soil erosion. In the 1950s, the Soviet Government directed that a center for scientific research be built in Novosibirsk, and in 1957 the multi-facility scientific research complex of Akademgorodok was constructed about 30 kilometers (19 mi) south of the city center. The Siberian Division of the Academy of Sciences has its headquarters in Akademgorodok, and the town hosts more than 35 research institutes and universities, among them Novosibirsk State University, one of the top Russian schools in Natural Sciences and Mathematics. Although it possesses a fully autonomous infrastructure, Akademgorodok is administered by Novosibirsk. On September 2, 1962, the population of Novosibirsk reached one million. At that time, it was the youngest city in the world with over a million people. Novosibirsk took fewer than seventy years to achieve this milestone. In 1979, work began on the Novosibirsk Metro Transit System, culminating in the opening of the first line in 1985. On August 1, 2008, Novosibirsk was in the center of the path of a solar eclipse, with a duration of 2 minutes and 20 seconds. Novosibirsk is the administrative center of the oblast and, within the framework of administrative divisions, it also serves as the administrative center of Novosibirsky District, even though it is not a part of it. As an administrative division, it is incorporated separately as the City of Novosibirsk—an administrative unit with the status equal to that of the districts. As a municipal division, the City of Novosibirsk is incorporated as Novosibirsk Urban Okrug. According to the Federal State Statistics Service, in January 2015 the number of residents came to 1,567,087. This is an increase compared to the 2010 Census, when the population of the city was 1,473,754. People from over eighty ethnicities and nationalities reside in Novosibirsk. The largest groups are Russian, Yakut, German, Ukrainian, Tatar, Jewish, and Belarusian. The best-known trees native to Novosibirsk are birch, pine, and aspen. Some mountain ash, hawthorn, spruce, and fir are also present. European species of apple, ash, elm, linden, and oak have been successfully introduced. The city stands on the banks of the Ob River in the West Siberian Plain. To the south of the city lies the Priobskoye Plateau. The climate in Novosibirsk is typical of Siberia, with a clear sky and far-below-freezing winter temperatures. The reason for these temperatures is the absence of nearby ocean, the Ural Mountains, barring Atlantic air masses from reaching Siberia, and the lack of tall mountains at the north of Novosibirsk, that could have held back freezing Arctic winds. In fact, Novosibirsk is the second-farthest substantially populated city from the ocean, the first being Ürümqi in China. The climate is humid continental (Köppen Dfb), with warm summers and bitterly cold winters. Snow is frequent, falling on almost half of all winter days, but individual snowfalls are usually light. On average temperatures range in summer from +15 °C (59 °F) to +26 °C (79 °F) and in winter from −20 °C (−4 °F) to −12 °C (10 °F). However, winter temperatures can go as low as −30 °C (−22 °F) to −35 °C (−31 °F), and summer temperatures can go as high as +30 °C (86 °F) to +35 °C (95 °F). The difference between the highest- and lowest-recorded temperatures is 88 °C (158 °F). Travellers coming from countries with mild climates may find Novosibirsk's winter tough, but it may not be extraordinary for those from northern countries. At times, bitter cold may hold for some days, but temperatures of −40 °C (−40 °F) and lower do not occur every year. In the springtime, streets and roads become dirty as a result of mud and melting snow, while the weather is still cold. Source: "Mean monthly climatic data for the city of Novosibirsk from 1961 to 1990". Roshydromet. Retrieved October 17, 2010. Novosibirsk is home to Russia's most powerful shortwave relay station east of the Ural mountains. This relay station can reach most of South Asia, the Middle East, and China. The Magadan and Vladivostok relay stations when operated in conjunction with Novosibirsk can guarantee that the Voice of Russia or any other broadcaster renting time at Novosibirsk is heard in the intended target area. Novosibirsk is the third-largest city in Russia (after Moscow and St. Petersburg) and the first in Siberia in which a metro system was established (the Novosibirsk Metro, opened in 1985). It is a major stop on the Trans-Siberian Railway and north end of Turkestan–Siberia Railway. The city is served by Novosibirsk Tolmachevo Airport with regular flights to Europe and Asia as well as to other Russian cities. Tolmachevo is the hub for S7 Airlines. There is also the auxiliary Yeltsovka Airport. A smaller field for general aviation at Novosibirsk Severny Airport was closed in 2012. From other modes of transport there is a bus (launched in 1923), tram (launched in 1934), trolleybus (launched in 1957), and marshrutkas. Novosibirsk is a large industrial center. The industrial complex consists of 214 large and average sized industrial enterprises. These produce more than two thirds of all industrial output of the Novosibirsk region. Leading industries are airspace (Chkalov's Novosibirsk Aircraft Plant), nuclear fuel (Novosibirsk Chemical Concentrates Plant), turbo- and hydroelectric generators (NPO ELSIB), textile machinery (Textilmach), agriculture machinery (NPO "Sibselmash"), electronics components and devices production (Novosibirsk Factory and Design Bureau of Semiconductor Devices NZPP, OXID Novosibirsk Plant of Radio components), metallurgy and metal working (Kuzmina's Novosibirsk Metallurgical Plant, Novosibirsk Tin Plant" OJSC, and JSC "Plant of Rare Metals). According to the television station RBC Novosibirsk took third place in 2008 in the list of the cities of Russia most attractive to business (in 2007 it was placed thirteenth). Before the relocation of its headquarters to Ob, S7 Airlines had its head office in Novosibirsk. Novosibirsk is the home town of several former Olympians, including Aleksandr Karelin, a twelve-time world Greco-Roman wrestling champion who has been voted the greatest Greco-Roman wrestler of the twentieth century by FILA. The city also hosts a number of National and International Ice Speedway events. Siberia Novosibirsk competed in the Russian Ice Speedway Premier League in 2012/13, and will do so again in 2013/2014. Several contemporary classical violinists, such as Vadim Repin, the late Alexander Skwortsow, Natalia Lomeiko, and Maxim Vengerov, are natives of Novosibirsk. Also born in the city were punk legend, poet and singer-songwriter Yanka Dyagileva, tragic punk rocker Dmitry Selivanov, folk/folk-rock singer Pelageya Khanova and cellist Tatjana Vassiljeva. The city possesses a Conservatory (named in honor of Mikhail Glinka); Novosibirsk State Philharmony, that is home for Novosibirsk Academic Symphony Orchestra, Novosibirsk Philharmonic Chamber Orchestra, Russian Academic Orchestra of Folk Instruments, and other musical groups; Novosibirsk Opera and Ballet Theater, and several notable music venues. The Quality Schools International QSI International School of Novosibirsk, previously located in Akademgorodok, opened in 2008. 16 cinemas, including Cinema Park which supports IMAX and IMAX 3D. Novosibirsk Planetarium (2012) was awarded in 2015 as the best social infrastructure object in Russia. The Novosibirsk Zoo is a world-renowned scientific institution as well as a popular tourist attraction. The zoo has over 11,000 animals from 738 species and is an active participant in thirty-two different captive breeding programmes for endangered species. On average, around 1.5 million people visit the zoo each year. Violinist Mikhail Simonyan, playwright and prose writer Nina Mikhailovna Sadur, and three-time Olympic Greco-Roman wrestling champion Aleksandr Karelin were born and raised in Novosibirsk. Spartak Stadium and city surroundings. Trains at the Novosibirsk railway station. ^ a b Государственный комитет Российской Федерации по статистике. Комитет Российской Федерации по стандартизации, метрологии и сертификации. №ОК 019-95 1 января 1997 г. «Общероссийский классификатор объектов административно-территориального деления. Код 50 240», в ред. изменения №278/2015 от 1 января 2016 г.. (State Statistics Committee of the Russian Federation. Committee of the Russian Federation on Standardization, Metrology, and Certification. #OK 019-95 January 1, 1997 Russian Classification of Objects of Administrative Division (OKATO). Code 50 240, as amended by the Amendment #278/2015 of January 1, 2016. ). ^ Article 5 of the Charter of Novosibirsk lists a flag and a coat of arms but not an anthem among the symbols of the city. ^ a b c Государственный комитет Российской Федерации по статистике. Комитет Российской Федерации по стандартизации, метрологии и сертификации. №ОК 019-95 1 января 1997 г. «Общероссийский классификатор объектов административно-территориального деления. Код 50 401», в ред. изменения №278/2015 от 1 января 2016 г.. (State Statistics Committee of the Russian Federation. Committee of the Russian Federation on Standardization, Metrology, and Certification. #OK 019-95 January 1, 1997 Russian Classification of Objects of Administrative Division (OKATO). Code 50 401, as amended by the Amendment #278/2015 of January 1, 2016. ). ^ Федеральная служба государственной статистики. Федеральное агентство по технологическому регулированию и метрологии. №ОК 033-2013 1 января 2014 г. «Общероссийский классификатор территорий муниципальных образований. Код 50 701». (Federal State Statistics Service. Federal Agency on Technological Regulation and Metrology. #OK 033-2013 January 1, 2014 Russian Classification of Territories of Municipal Formations. Code 50 701. ). ^ "International Dialing Codes - how to call from Hong Kong – Hong Kong to Russia – Novosibirsk – Novosibirsk". ^ "Численность населения по муниципальным районам и городским округам Новосибирской области на 1 января 2018 года и в среднем за 2017 год" (PDF). Novosibirsk Oblast Territorial Branch of the Federal State Statistics Service. ^ Новосибирская ГЭС. Вокруг здания ГЭС, водосливная плотина :: Gelio | Слава Степанов Archived August 8, 2013, at the Wayback Machine. Gelio.newsib.ru. Retrieved on 2013-08-16. ^ "Сельское хозяйство :: Бизнес-журнал, новости Новосибирска и Новосибирской области". Biz.newsib.ru. Archived from the original on February 24, 2013. Retrieved March 12, 2013. ^ "From Novosibirsk to Komsomolsk". TIME. May 4, 1942. Retrieved May 6, 2009. ^ "Novosibirsk, Siberia, Russia History & Info". Utopiasprings.com. Retrieved May 6, 2009. ^ "Novosibirsk Mayor Office Web Site, City History Page". Novosibirsk Mayor Office. Archived from the original on March 7, 2008. Retrieved February 13, 2008. ^ "Численность населения по муниципальным районам и городским округам Новосибирской области на 1 января 2015 года и в среднем за 2014 год" (PDF) (in Russian). Novosibirsk Oblast Territorial Branch of the Federal State Statistics Service. ^ "Weather and Climate-The Climate of Novosibirsk" (in Russian). Weather and Climate. Retrieved May 5, 2016. ^ Cappelen, John; Jensen, Jens. "Rusland - Novosibirsk" (PDF). Climate Data for Selected Stations (1931-1960) (in Danish). Danish Meteorological Institute. p. 225. Archived from the original (PDF) on April 27, 2013. Retrieved April 7, 2017. ^ "Государственные вузы Новосибирской области". Sr-nso.nstu.ru. Retrieved September 16, 2011. ^ (in English) "Study in Russia: National Research Tomsk State University". Ministry of Education and Science of the Russian Federation. Retrieved July 1, 2017. ^ "People". www.bolshoi.ru. Retrieved January 1, 2018. ^ "Central Siberian Botanical Garden/Центральный сибирский ботаническй сад СО РАН". bgci.org. Retrieved August 6, 2015. ^ (in Russian) "ИСТОРИЯ ЗООПАРКА". Novosibirsk Zoo official page. Retrieved July 4, 2017. Городской Совет Новосибирска. Решение №616 от 27 июня 2007 г. «Устав города Новосибирска», в ред. Решения №1311 от 31 марта 2015 г. «О внесении изменений в устав города Новосибирска, принятый Решением городского Совета Новосибирска от 27.06.2007 №616». Вступил в силу через 10 дней со дня официального опубликования, за исключением положений, для которых установлены иные сроки и порядок вступления в силу. Опубликован: "Бюллетень органов городского самоуправления Новосибирска", №58, стр. 3, 15 августа 2007 г. (City Council of Novosibirsk. Decision #616 of June 27, 2007 Charter of the City of Novosibirsk, as amended by the Decision #1311 of March 31, 2015 On Amending the Charter of the City of Novosibirsk Adopted by the Decision #616 of the City Council of Novosibirsk of June 27, 2007. Effective as of 10 days after the official publication date, with the exception of the clauses for which different dates and procedures of taking effect are specified.). Новосибирский областной Совет депутатов. Постановление №282-ОЗ от 31 марта 2005 г. «Устав Новосибирской области», в ред. Закона №529-ОЗ от 26 февраля 2015 г. «О поправках к Уставу Новосибирской области». Вступил в силу 1 мая 2005 г. Опубликован: "Советская Сибирь", №81, 29 апреля 2005 г. (Novosibirsk Oblast Council of Deputies. Resolution #282-OZ of March 31, 2005 Charter of Novosibirsk Oblast, as amended by the Law #529-OZ of February 26, 2015 On Amending the Charter of Novosibirsk Oblast. Effective as of May 1, 2005.). Новосибирский областной Совет депутатов. Закон №246-ОЗ от 17 декабря 2004 г. «Об административных центрах муниципальных районов и сельских поселений Новосибирской области», в ред. Закона №69-ОЗ от 5 декабря 2006 г. «О внесении изменений в Закон Новосибирской области "Об административных центрах муниципальных районов и сельских поселений Новосибирской области"». Вступил в силу со дня официального опубликования. Опубликован: "Советская Сибирь", №252, 29 декабря 2004 г. (Novosibirsk Oblast Council of Deputies. Law #246-OZ of December 17, 2004 On the Administrative Centers of the Municipal Districts and Rural Settlements of Novosibirsk Oblast, as amended by the Law #69-OZ of December 5, 2006 On Amending the Law of Novosibirsk Oblast "On the Administrative Centers of the Municipal Districts and Rural Settlements of Novosibirsk Oblast". Effective as of the official publication date.). Novosibirsk journal about life in Siberia "Sib.fm"
Barabinsk is a town in Novosibirsk Oblast, Russia, located in the Baraba steppe on the Trans-Siberian Railway between Omsk and Novosibirsk. Population: 30,394 (2010 Census); 32,501 (2002 Census); 36,501 (1989 Census). Iskitim is a town in Novosibirsk Oblast, Russia, located on the Berd River. Population: 60,078 (2010 Census); 62,756 (2002 Census); 67,849 (1989 Census). Kuybyshev is a town in Novosibirsk Oblast, Russia, located on the Om River, 315 kilometers (196 mi) west of Novosibirsk, the administrative center of the oblast. Population: 45,299 (2010 Census); 48,848 (2002 Census); 51,171 (1989 Census); 40,000 (1970). Kargat is a town and the administrative center of Kargatsky District in Novosibirsk Oblast, Russia, located on the Kargat River. Population: 10,042 (2010 Census); 11,184 (2002 Census); 12,561 (1989 Census); 12,600 (1979); 12,700 (1959). Toguchin is a town and the administrative center of Toguchinsky District in Novosibirsk Oblast, Russia, located on the Inya River 125 kilometers (78 mi) east of Novosibirsk, the administrative center of the oblast. Population: 21,900 (2010 Census); 22,179 (2002 Census); 23,189 (1989 Census). Bolotnoye is a town and the administrative center of Bolotninsky District in Novosibirsk Oblast, Russia, located 126 kilometers (78 mi) northeast of Novosibirsk, the administrative center of the oblast. Population: 16,570 (2010 Census); 18,170 (2002 Census); 20,006 (1989 Census). Cherepanovo is a town and the administrative center of Cherepanovsky District in Novosibirsk Oblast, Russia, located 109 kilometers (68 mi) southeast of Novosibirsk, the administrative center of the oblast. Population: 19,803 (2010 Census); 20,496 (2002 Census); 22,116 (1989 Census). Chulym is a town and the administrative center of Chulymsky District in Novosibirsk Oblast, Russia, located on the Chulym River 131 kilometers (81 mi) of Novosibirsk, the administrative center of the oblast. Population: 11,568 (2010 Census); 12,275 (2002 Census); 13,703 (1989 Census). It was previously known as Chulymskoye. Karasuk is a town and the administrative center of Karasuksky District in Novosibirsk Oblast, Russia, located on the Karasuk River 678 kilometers (421 mi) west of Novosibirsk, the administrative center of the oblast. Population: 28,586 (2010 Census); 28,734 (2002 Census); 29,401 (1989 Census). Barabinsky District is an administrative and municipal district (raion), one of the thirty in Novosibirsk Oblast, Russia. It is located in the western central part of the oblast. The area of the district is 5,400 square kilometers (2,100 sq mi). Its administrative center is the town of Barabinsk. Population: 14,169 ; 17,126 (2002 Census); 18,279 (1989 Census). Chistoozyorny District is an administrative and municipal district (raion), one of the thirty in Novosibirsk Oblast, Russia. It is located in the southwest of the oblast. The area of the district is 5,690 square kilometers (2,200 sq mi). Its administrative center is the urban locality of Chistoozyornoye. Population: 19,603 ; 22,444 (2002 Census); 24,126 (1989 Census). The population of Chistoozyornoye accounts for 32.8% of the district's total population. Iskitimsky District is an administrative and municipal district (raion), one of the thirty in Novosibirsk Oblast, Russia. It is located in the east of the oblast. The area of the district is 4,384 square kilometers (1,693 sq mi). Its administrative center is the town of Iskitim. Population: 62,816 ; 66,420 (2002 Census); 67,733 (1989 Census). Kuybyshevsky District is an administrative and municipal district (raion), one of the thirty in Novosibirsk Oblast, Russia. It is located in the center of the oblast. The area of the district is 8,823.3 square kilometers (3,406.7 sq mi). Its administrative center is the town of Kuybyshev. Population: 15,466 ; 19,386 (2002 Census); 21,758 (1989 Census). Novosibirsky District is an administrative and municipal district (raion), one of the thirty in Novosibirsk Oblast, Russia. It is located in the east of the oblast. The area of the district is 2,900 square kilometers (1,100 sq mi). Its administrative center is the city of Novosibirsk. Population: 127,891 ; 113,047 (2002 Census); 130,300 (1989 Census). Ordynsky District is an administrative and municipal district (raion), one of the thirty in Novosibirsk Oblast, Russia. It is located in the southeast of the oblast. The area of the district is 4,748 square kilometers (1,833 sq mi). Its administrative center is the urban locality of Ordynskoye. Population: 36,708 ; 39,209 (2002 Census); 38,231 (1989 Census). The population of Ordynskoye accounts for 27.9% of the district's total population. Tatarsky District is an administrative and municipal district (raion), one of the thirty in Novosibirsk Oblast, Russia. It is located in the west of the oblast. The area of the district is 4,870 square kilometers (1,880 sq mi). Its administrative center is the town of Tatarsk. Population: 15,875 ; 19,297 (2002 Census); 20,718 (1989 Census). Ob is a town in Novosibirsk Oblast, Russia, located 17 kilometers (11 mi) west of Novosibirsk, the administrative center of the oblast. Population: 25,382 (2010 Census); 24,473 (2002 Census); 25,014 (1989 Census). Tatarsk is a town in Novosibirsk Oblast, Russia, located 457 kilometers (284 mi) west of Novosibirsk, the administrative center of the oblast. Population: 24,217 (2010 Census); 26,051 (2002 Census); 30,355 (1989 Census); 31,000 (1974). 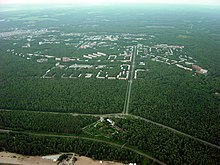 Kochenyovo is an urban-type settlement and the administrative center of Kochenyovsky District, Novosibirsk Oblast, Russia. Population: 16,374 (2010 Census); 16,510 (2002 Census); 15,048 (1989 Census).